Contemporary art always seems to be reinventing itself. In fact, almost the very nature of the word 'contemporary' seems to imply a constant sense of reinvention and re-examination. Every since Marcel Duchamps stuck a urinal in a gallery in 1917, scrawled the name 'R. Mutt' on it and titled it "Fountain", thereby kicking off the Dada movement in the popular imagination and all that came after it, there has been a constant desire to push the envelope of what constitutes "art". That trend is rarely more visible now than in many types of installation work that, in many opinions, border on the ridiculous (see our recent post about Shia LaBeouf's attempt to apologize for plagiarism with a plagiarised installation/exhibit titled #IAMSORRY). An equally in-your-face artistic revolution has been taking place outside the gallery over the past several decades, in the form of graffiti. 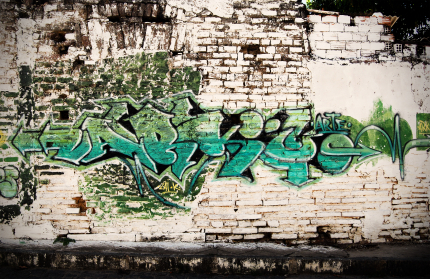 While many scoffed at the elaborate system of tags that suddenly appear across the concrete canvases that fill the urban world, it is growing harder and hard to maintain the belief that there is no artistic merit to the pieces. By now, the name 'Banksy' is popular from the art world to the hipster world and many places in between, arguably the poster child for the serious street artist (though doubtless, he would reject that with a smirk). Any number of street artists have more cult followings, but the popularity is on the rise. Nothing showcases the rising arc of street art's popularity more thoroughly than the furor that arose surrounding the mural 'Slave Labour' by Banksy in 2013. Painted as a large mural on the side of a thrift store in North London during a single night, the piece depicts a small boy sewing a Union Jack. As a result of this choice of venue/canvas - sometimes it can be hard to tell which is which with street art, as the reactions of the passersby must surely be considered part of the piece itself - the owners of the building instantly became the owners of the piece itself, and had the entire section of concrete wall removed. The piece, such as it is, eventually sold at auction for a staggering $1.1 million USD. If that doesn't drive home the reality of street art as valid, nothing will. Finally, many of those who began careers and gained fame as street artists have quite comfortably made the transition to more easily saleable formats. Shepard Fairey, a United States-born street artist famous for a number of pieces, most notably a widespread sticker campaign featuring late wrestler Andre the Giant beneath huge block letters saying 'OBEY', was also the creator of one of the most iconic images of the last decade, a red blue and yellow poster featuring President Barack Obama subtitled 'Hope'. Banksy also hasn't steered clear of similar popular fame, having even recently produced a documentary (arguably a mockumentary) recently entitled 'Exit Through the Gift Shop', which we'll be looking at in our next post! Wednesday 01st June 2011Project for Empty Space Fundraiser - This Saturday! We're fans and supporters of Project for Empty Space, so it's our duty and pleasure to inform you of their first Annual Benefit, which will take place this Saturday, the 4th June from 5 - 10pm. Informed by the City: A Fundraiser, will be held at the Tribeca Grand in New York, and tickets are on sale now! Project for Empty Space was founded by Meenakshi Thirukode and Jasmine Wahi, as a non-profit organisation that fosters a stronger community and builds upon education through the development of interactive public art. They bring cutting edge contemporary art to communities throughout the City of New York, by making excellent use of abandoned and disused urban spaces. The evening event will itself be hosted by a range of artists who are informed and inspired by the City of New York, and will include a screening of David Henry Gerson's short film, Ultra Violet for Sixteen Minutes. The artist will then hold a discussion about the film, and how New York, and the art scene in the 1960's has influenced his output. The film itself focuses on Ultra Violet, the lady who was mistress to Salvador Dali, and muse to Andy Warhol. In this sixteen minute documentary she reveals her perspectives on fame, art and religion, and it includes rare photographs, as well as Andy Warhol's screen-test of Ultra Violet from 1965. Not to be missed. Please visit the fundraiser event page for more information, and to book tickets, of follow Project for Empty Space on Facebook for more information. Anybody that keeps up to date with what's happening on the big stage of the contemporary art world will definitely be familiar with few of the names that have made it on to the ArtReview Power 100 for 2010. As stated by ArtReview, this is more than just a list of the most favoured people in the art world at the moment, or a who's who of the faces on the contemporary scene. What the list represents is the group of people who are actively shaping the art world, who are key to current trends and who form some of the most important networks in terms of market development and the proliferation of contemporary art across the world. Whatever you think of the list and the people on it, you can't argue that it isn't interesting to see who made it onto the list, where they sit in the list and why they got there. The top 10 are all reconisable art world giants, for a range of different reasons. Gallerist Larry Gagosian made it in at number 1, beating curator Hans Ulrich Obrist who held the top spot last year. It's no surprise that Gagosian is sitting pretty this year; he now has 9 gallery spaces around the world, beating the likes of David Zwirner who is also in the top 10, and seems to have unlimited powers when it comes to dictating how things the art world around him should be orchestrated. Hans Ulrich Obrist takes the second spot on the chart for continuing to be a serious power curator in a year when curatorial budgets were not looking too hot. On the museum side of things, MoMA Director Glenn D. Lowry comes in at number 5 and the leader at the Tate, Sir Nicholas Serota, comes in at number 7. Three million people descended on MoMA this year, in part to see some of the great contemporary exhibitions that the museum presented. It could be easy for MoMA to sit back and bask in the glory of their fantastic modern art collection, but they don't. They push forward and stick with the flow of the contemporary art scene, ensuring that MoMA stays relevant and at the centre of the art world. The Tate on the other hand has been critised a lot this year for things like their relationship with BP, but as ArtReview rightly points out, "if it weren't for Tate Modern, London wouldn't be the art centre it has become." Pat on the back for Sir Nick. A certain power collector also made it into the top 10, and it's no surprise given his contemporary art empire. An art collection worth more than $1billion, an entire wing at LACMA, a hefty investment of $30 million in LA MOCA and even his own museum. Not bad going. Visit the ArtReview 100 website to get the full listing and to take a closer look at some of the most powerful and interesting characters in the contemporary art world. Saturday 21st August 2010Artwork that Goes With a Bang! Throughout art history, artists have experimented with different materials and processes of making work; pushing creative boundaries and developing new ways of depicting and representing the world around us. 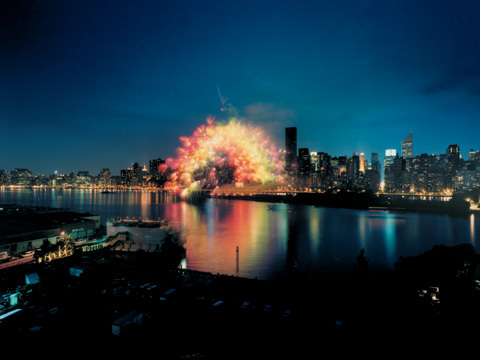 Few methods of creating an artwork, however, could be said to be more exciting than that used by Chinese artist Cai Guo-Qiang. 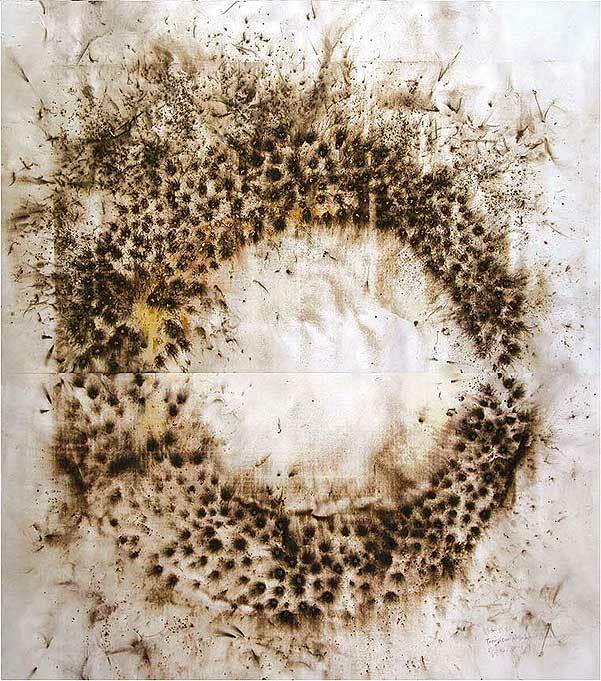 Working primarily with gun powder, Cai is famous for making explosive works, both sculpturally like in Transient Rainbow, as shown above, which was created on the banks of the river in New York in 2002, and also on paper, like this drawing for Transient Rainbow from the Museum of Modern Art's collection. It has now been reported the Cai has been asked to create his first permanent, site-specific installation in a United States museum. The Museum of Fine Arts, Houston has commissioned Cai to create one of his signature gun powder drawings to line the walls of the Tin Tsung and Wei Fong Chao Arts of China Gallery, which will open at the MFAH this October. The work will be created in a 25,000-square-foot warehouse in Houston in early October, ready for the opening of the gallery on the 17th. What makes the occasion even more special is that the creative process that Cai will go through will be open to the public for viewing. The Guggenheim New York and YouTube have joined forces to create YouTube Play. A Biennial of Creative Video, where a jury of informed individuals will seek to discover and showcase some of the best artist talent to be found in the realm of online video. This project has already drawn major world wide attention with more than 6,600 videos having been submitted since YouTube Play was announced on 14th June. The YouTube Play channel has already attracted more than 2.6 million viewers as the submissions continue to arrive before the deadline of 31st July. The panel of judges for the biennial is impressive in itself, featuring, to name just a few, artists Douglas Gordon, Ryan McGinley, Marilyn Minter and Takashi Murakami, filmmaker Darren Aronofsky, artist and filmmakers Shirin Neshat and Apichatpong Weerasethakul as well as graphic designer Stefan Sagmeister. The jury is chaired by Guggenheim Chief Curator and Deputy Directory Nancy Spector. To find out more and perhaps make a submission, visit YouTube Play. Being constantly on the look out for cool exhibitions, upcoming artists or new and interesting places to visit, we came across an article on the artdaily.org website (a great place for art information from around the world if you're interested!) announcing that Europe is to host Sam Francis' biggest show since 1995! European fans of the this American painter and printmaker have every right to be excited. 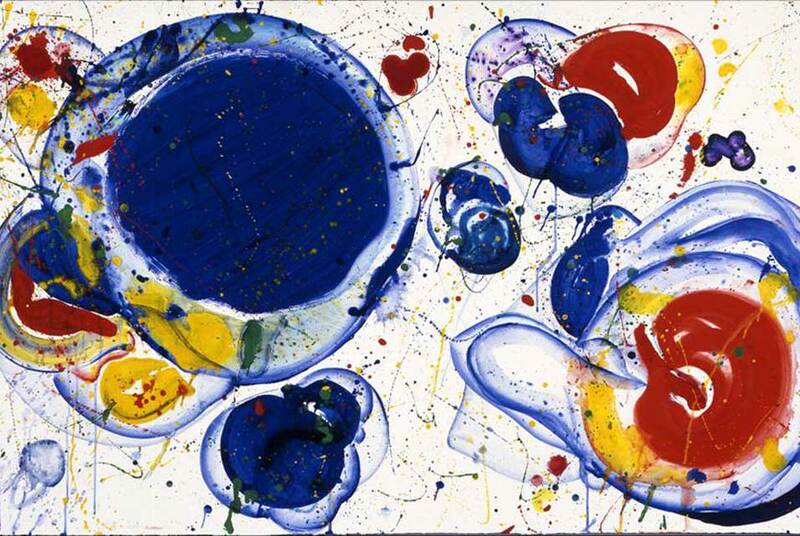 The show, titled Sam Francis: Retrospective in Blue, will be on show at the Danubiana Meulensteen Museum in Slovakia from 20th June until 29th August and will bring together 100 works from this world famous artist. Saturday 05th June 2010Where will Gallereo be Next? The Berlin Biennale!! That's right, this week Gallereo will be all over Berlin soaking up as much art and culture as possible...even though we're well aware that we'd need the rest of the year to take everything in. The 6th Berlin Biennale for Contemporary Art will kick off on on the 11th June, and runs through until the 8th August so there's plenty of time to make your way around the various venues, from the KW institute of Contemporary Art, right across to the Alte Nationalgalerie on Museum Island.